Love is Friendship – That’s where it all started for us back in 2000-02 at Sri Balaji Society - Yerawada Pune campus (erstwhile Indian Institute of Modern Management – IIMM). We got to know each other almost towards the 3rd semester of the management program even though being in the same class of Trendsetters’ batch. Soon, we will be celebrating our tenth wedding anniversary in December and still feels like we met yesterday. We both stayed in respective hostels at Vishrantwadi and the opportunity to get to know each other came through the long walks we used to take from Agrasen campus to Vishrantwadi in the evening along with all other friends. We liked each other’s company and there were lots of common interest like music, books, movies sweets, travelling and day dreaming despite being exactly 180 degrees’ apart corners of India map as it was east meets west. But the utmost important match point was sharing similar values, having identical dreams, and the desire to succeed. It was during the tough time of campus placements during the 2002 recession that cemented our relationship further and taught us to become a pillar of strength for each other and to work hard to conquer our dreams. It was his birthday morning in January and we had our computer class 9 AM, in the basements at Vishrantwadi old campus premises. I got ready early morning and ran through the entire stretch from Ram housing society to Vishrantwadi with a bouquet of roses to surprise him at his place. All his other friends were too taken aback and made a bit of fun but then it was fine and that was the day he proposed me. It still took time for me to realise that this is nothing but love. Soon after, he talked about our relationship with his parents and that’s where I got impressed by his simplicity and honesty and commitment. 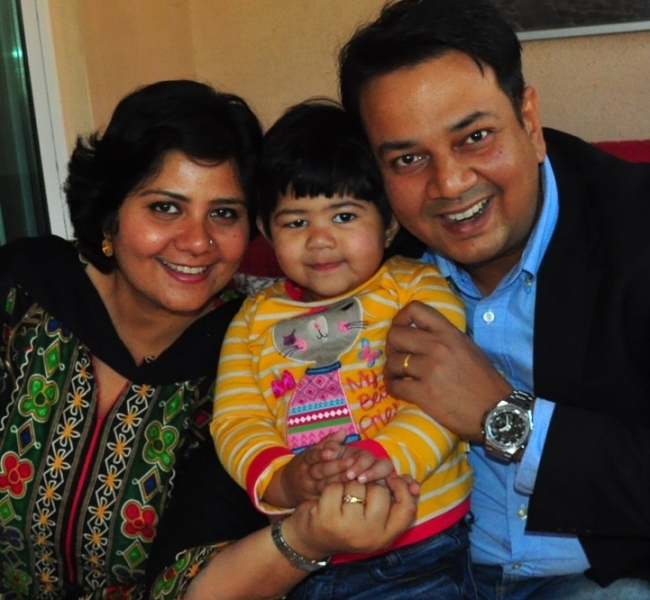 His parents came to Pune from Calcutta to see us and kind of conformed our togetherness. But, the case was opposite with my Parents, hailing from a Rajput family, my father could not think for a second to marry me outside of Rajput clan. It took almost four years after our placements to get our parents together for our marriage ceremony. And now it doesn’t seem like we have had any issues for our marriage as both sets of parents have reaffirmed many a times of their happiness to see us together and more so seeing their next generation – our daughter Abira, swinging with life. The two years spent at the campus right from the DAY 1 of throwing each one of us to give spontaneous presentation before Dilip Bam Sir and 100s of students to presenting our candidature before corporates for campus placements kept reinforcing the ultimate mantra of Bala Sir – Problems are opportunities and one can undoubtedly overcome almost anything and achieve your goals with discipline, determination and dedication. Although we didn’t get the luxury of being in the new campus that Sri Balaji Society students have access today, but the Agrasen school campus, Ram housing society, Vishrantwadi’s Somsukh Lodge, Prabhat complex basement computer Lab, Pune University’s IUCA conference hall, Baigs chai corner and Daryl’s kitchen were all so seamlessly integrated that we all felt them to be a part of our huge campus. Even at the old campus we had stalwarts from the corporate and academic worlds to teach us - our professors Ramashastry, Deshpande, Rao, Moodliar and many more. Then came the most crucial and testing time – the campus placements that kind of coincided with 9/11 incident and a very bleak economic outlook. In spite of facing all sorts of odds in terms of being a 2nd batch of tier 2 Institute in year 2000-2002, Bala Sir and we all were kind of determined not to leave any stone unturned to spot the opportunities for pulling the companies to the campus for placements. And that’s where both of us found the call on notice board from our respective companies – AvesthaGen Biotech and TAFE. Shweta being a Botany Hons graduate from Delhi University and had done internships in Monsanto and Novartis was happy to get a break with Bangalore based Agri Biotechnology company Avesthagen. She joined them as management trainee and soon got promoted as Associate Manager handling the business development of their Agri & food testing Lab in Hyderabad. It was an eventful 2 years stint organising Avesthagen’s set ups in Bangalore Bio , APEDA’a AAHAR exhibitions and many more and promoting NON GMO and organic food certification much ahead of their time. Then came an opportunity from Ma Foi Management Consultants- India’s pioneer in HR & Recruitment industry, who had recruited the trendsetter batch topper through campus. I joined them in 2004 as Consultant-Business development in Chennai , moved to Delhi as senior consultant , then to Pune as Team Manager , excelling ahead to become Regional Manager in Chennai and Senior Manager in Delhi handling various HR service portfolios of Ma Foi across these regions both in Private and Public sector units. I was given an exemplary contribution award towards the completion of my 5 years with Ma Foi in India in 2009 and soon Ma Foi was taken over by Randstad. Destiny always surprises you – nothing describes Birendra’s journey so far better than this! Quintessential academically inclined introvert guy instead of pursuing higher studies, takes up production job and then goes on to sales and then international business development doesn’t seem symmetrical but the new algorithm was in making! Birendra is WBUAFS gold medallist and topper of B.Tech. in Food technology for Eastern Region. While I was preparing to go for higher studies, there came a job offer from a casually given interview and it was none other than Metro Dairy Ltd – The largest Dairy company of Eastern region). And, there I became a management trainee in their Ice Cream division and started my professional life. Ice cream filled days were enjoyable but within a year realized that my interest lies in bigger challenges. While looking for an MBA course once again my father insisted that he came across a new path breaking institute which will be suitable for me. That’s how I came to know about Sri Balaji Society which is my Alma Mater. Those two years at the campus equipped me with skill and attitude to take on the world. In 2002, I returned to working life with the Engineering giant TAFE through campus placement and it was an amazing experience working across the farming regions of India to sell TAFE tractors. Soon, got an opportunity to join Shell Lubricants as Sales Manager for the northern region. The stint with Shell was exceptionally practical and prepared me with the real world business challenges and truly transformed me into a thoughtful business person. But I was still hungry and knew that the globe is my home and there I got a break with a HongKong based multinational Watanmal Group in 2005. I joined them as Category Manager in their meal based division and launched various canned products for West African markets which are successful till today. The stint with Watanmal gave me a tremendous exposure of an end to end chain of farm to fork covering global markets ranging from USA, Europe, Africa & Asia Pacific. The tenure spanned for 5 years and I was based in China, Nigeria, Ghana and India during these years. In year 2009 we charted for foreign land as Birendra with his international business experience got an opportunity in Geneva based multinational Webcor Group to be based in Singapore. Shweta followed him and joined Randstad Singapore and had wonderful stint there for close to 3 years. Birendra joined Webcor Group in 2009 as Business Unit Manager handling South East Asia Sourcing and South African consumer markets. It’s truly been an enriching journey with Webcor group working with myriad nationalities and being able to add some of the most profitable product lines and create new brands which are doing exceptionally well in Angola and South Africa markets. Once again, we were called by other side of the shores and moved to Dubai when Webcor shifted its headquarters to Dubai in year 2012. Dubai has been more special to us as we got our daughter Abira in this land in year 2013 and the same year around, Birendra got promoted as the youngest General Manager - House Brands & Mozambique managing a turnover of USD 100 million. To fulfil a long-cherished dream Shweta set up a small venture called Indistan promoting & marketing Indian handicrafts in Global markets including UAE & Middle East markets sourced directly from rural artisans in India. Shweta has also gotten back with her dream team of Ma Foi that is rechristened as CIEL HR services. She has taken up the partnership in the Business operations of CIEL HR in Dubai & Middle East. Respecting each other’s individuality and giving space and to work towards realising each other’s dreams and aspirations is utmost important. Life always surprises you, however prepared you are! Opening to change is the most important aspect. There will be difficulties both personally and professionally in a married life but both the partners need to understand and chip in at the right time to support during crisis. Create small personal milestones and achieve them regularly to make your life a series of celebrations. Happy marriage is a state of continuity and so you need to keep working towards it each day. It does involve few compromises from both the partners to achieve the larger goals & ultimate family happiness. The life changes for a couple radically after having kids and it takes a lot of maturity, planning, prioritising and empathy for each other to sail smoothly through the tides of change and new responsibilities. Doing better than others is not important – doing what you want is. Choosing the work, you wanted to do, leads you to be happy. Listening is not only hearing! This simple fact has profound impact on both Professional & Personal life. Being a good listener will solve half your problems. Our daughter Abira has just turned 3 years and we would be celebrating our 10 years of marriage in December. This year, we have also had our first ever BIMM alumni meet in Dubai under the leadership of Deepak Rai and embellished with our beloved Bala Sir’s august presence which made the event much more memorable and epic. So, for us, overall this year would end up with taking a full circle in many aspects of our lives but we would still like to believe that It is just a beginning!